While many question the efficacy of street protests against police brutality, the Bank Black movement has taken the country by storm. Black folks around the country are showing just how much their ‘Black Lives Matter’ by not only boycotting stores like Target and Coca Cola products but also moving their money. Black-owned banks around the country are seeing a surge in new accounts. A vibrant grassroots movement is making its way from coast to coast with social media hashtags like #moveyourmoney, #bankblack and text messages urging friends and family to move at least $100 to a Black bank. “If we can bring together our economics collectively, we can help businesses grow, we can help people obtain homes. That brings them closer to the American dream,” Frederick L. Daniels Jr. executive vice president and chief credit officer of Citizens Trust Bank told USA Today. The National Bankers Association, founded in 1927, is a consortium of Black, Hispanic, Asian, Native American and women-owned banks headquartered in Washington, D.C. Between 1888 and 1934, there were more than 130 Black banks. This wealth is believed to have been the engine behind the rapid growth of Black-owned businesses from 1867 when there were only 4,000 Blackowned businesses to 50,000 by 1917. There are currently 21 Black-owned banks in the U.S. with assets totaling between $4.5 to $4.7 billion, roughly 0.43 percent of Black America’s $1.1 to $1.4 trillion in spending power. In 1994, there were 54 African American owned banks according to the FDIC. Since July 8, literally thousands of checking and savings accounts have been opened at Black-owned banks. The Houston Chronicle reported that 350 new accounts were opened at Black owned Unity National Bank in Texas. 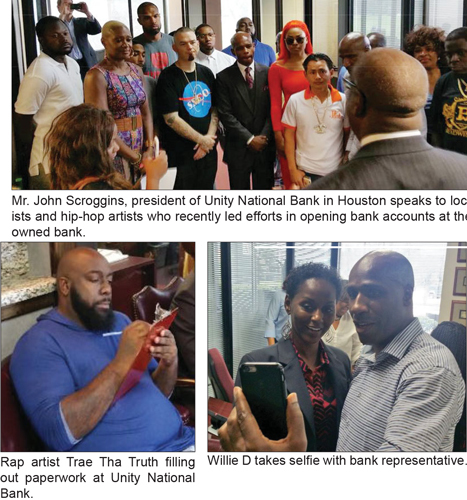 Local area hip-hop artists like K-Rino, Trae Tha Truth, Slim Thug, Paul Wall and more recently opened accounts at Unity after holding a meeting with Mayor Sylvester Turner and local activists in which they discussed solutions in pressing issues of police misconduct and violence in the community. “The Black Lives Matter movement is a complement to an emerging economic empowerment movement that is engulfing Black communities all over America,” stated Preston Pinkett, National Bankers Association Chairman and CEO of City National Bank, headquartered in Newark, N.J. Celebrities are also helping to spread the word. Rapper and activist Killer Mike’s July 7, radio interview with Hot 107.9’s Mz. Shyneka, urged Black people to take their money out of their current banks and put it into Citizen’s Trust in Atlanta. “Don’t spend a dollar on a dog that don’t speak up for you,” he said. “We need one million people in Atlanta to take $100 out of their existing account; put $100 into a Citizens Trust account. Let $100 million move into that. 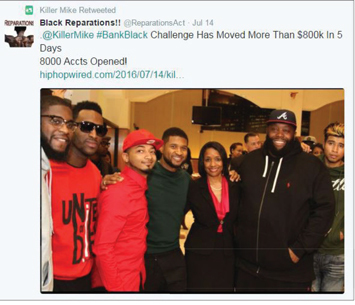 Take that $100 million and promise $15,000 to $18,000 in loans for Black businesses and small homes.” To kick off Black History Month earlier this year, Killer Mike, Usher, Jermaine Dupri and Big Krit reportedly opened accounts there. OneUnited Bank, the largest Black owned bank in America and the first Black internet bank, is launching the national #BankBlack Challenge, designed to harness the economic power of the Black community focused on one clear financial message that #BlackMoneyMatters, the financial institution recently announced. The good news about the increase in accounts at Black banks does have its challenges. Several new account holders have lost check writing privileges at other banks. Black bankers are asking customers to work with them to correct the situation and not to become frustrated during the process to return their check writing privileges. Mr. Grant also cautioned Black consumers to be patient with the mind boggling requests that banks are receiving on-line, in person and by telephone and not to lose interest because of small delays. He explained, “This is a very positive development for Black banks. They have always provided a disproportionate share of the small business loans and consumer loans to African-Americans,” he said. For years the Honorable Minister Louis Farrakhan has cautioned Blacks about the banking industry. “We must make the business world more accountable to us also. Take, for example, the situation of banks and their relationship to the Black community. Black people put millions of dollars into these banks, but get little or no benefits in return,” said the Nation of Islam Minister. For information on Black-owned banks in your area visit www.nationalbankers.org.